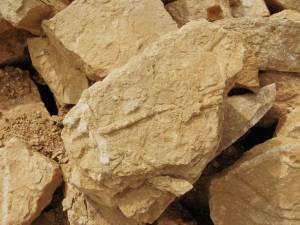 Geology Namurian sandstone above the Main Limestone and below the Little Limestone. Record Name Scargill. Stang Forest. 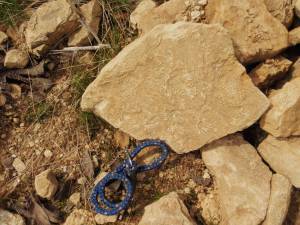 Massed trace fossils reported by Jackie Snow on surfaces of quarried sandstone by forest road. Record Description This Record is uploaded on the basis of information and photographs provided by Jackie Snow. These interesting fossils are probably plant remains, the linear tube like fossils may be roots of plants similar to the mangrove. The more elaborate trace fossils in image no 3 could be different parts of the same unidentified plants or alternatively but improbably, of echinoids. NOTE! 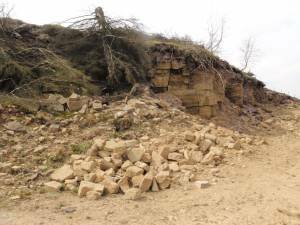 Quarries are dangerous places and if visited, Take Care. Additional Notes If any member can can identify these fossils, please let Jackie or me know. Image 1 Description The fossil location, a disused quarry by a forest road close to the top SW corner of the Stang Forest. Image 2 Description Unidentified trace fossils on surface of a quarried block. The linear tube like fossils are possibly roots of plants similar to mangroves. Image 3 Description Unidentified small complex trace fossils on surface of a quarried block. Probably these small trace fossils are of different parts of the same plants as the linear fossils on image 2 above.